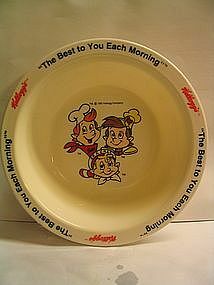 This plastic cereal bowl is dated 1995, and has a few utensil marks, and a slight loss of paint on the 1995. There are no cracks, breaks, chips, or roughness. I will need your zip code to calculate postage. 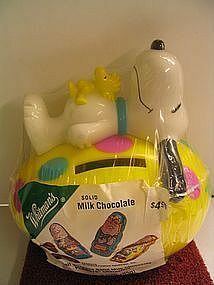 This Snoopy Easter collectible bank is still in its original packaging-it even has the chocolate inside, although I don't suggest making a snack of it! There is one small tear in the cellophane at the back, but that's all. The bank is dated 1998. I will need your zip code to calculate postage. 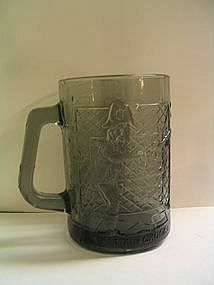 This Captain Crook mug was produced for McDonald's restaurant. I cannot find a date on it. No damage. I will need your zip code to calculate postage. Not sure of the name of this particular planter or the name. It has been packed in newspaper and this left some residue newsprint to the surface. There is a small area on the bottom, where a date has been marked out with permanent ink. Additional photos by email. I need your zip code to calculate the postage. 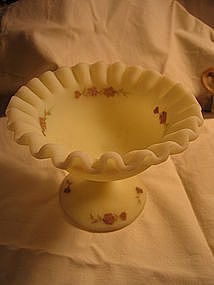 Compote style dish marked Fenton. 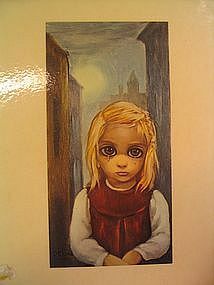 Handpainted and signed by S. Mullins. 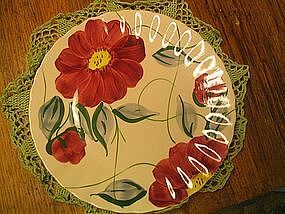 I do not know the actual pattern floral decoration. I will provide close-up photos for identification. It is approximately 4 inches in height and 5 inches in width. There are no chips, cracks, breaks or loss to the finish. I need your zip code to calculate the postage. This is a half-gallon pitcher. It has a paper label calling this a Great American made in Portugal. 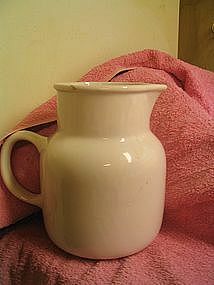 There is some crazing, and one paint chip, but otherwise, the pitcher is in good shape. I will need your zip code to calculate postage. 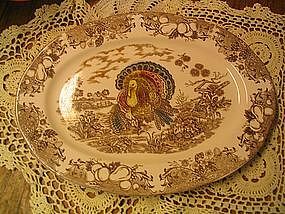 Luncheon plate (9 1/4 inches) in the Becky pattern by Blue Ridge. No chips, cracks, breaks or crazing. At one point, I thought the rim had a small chip, but it is glazed over, so would be considered a manufacturing flaw. Light utensil wear. 2 are available and priced individually. I need your zip code to calculate the postage. It measures ll inches in length and 5 1/2 inches in width. No chips, breaks, rough rims or crazing. Very light utensil wear as well slight damage to the base. Additional photos of condition and backstamp by email. I need your zip code to calculate the postage. 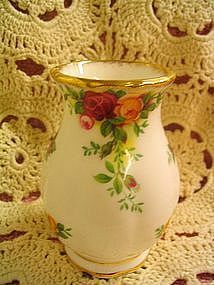 This is a posy vase in one of the "Old Country Roses" pattern. It measures three and a quarter inches in height. 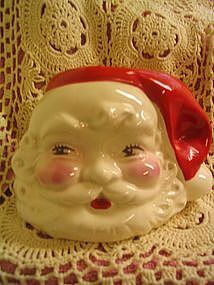 This piece was made in England, and is marked 1962 as well as 55. No damage. Additional photos available by email. I will need your zip code to calculate postage. 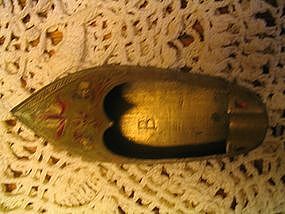 This pointy-toed brass slipper is a personal ashtray from the late 1960's or early 70's. There is very little wear to the red enameling that adorns the slipper, or to the slipper overall, though it has been used. It has developed a nice patina over the years. There are 2 ashtrays in this style available and priced individually. I will need your zip code to calculate the postage. 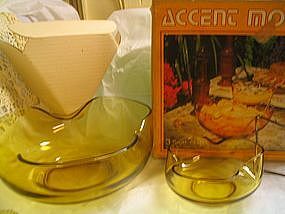 Back in the days when smoking was hip, a personal ashtray was sort of a novel idea. 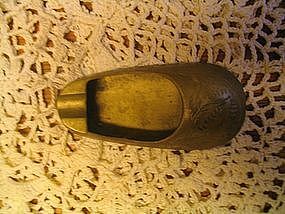 This little brass slipper was made in India, and has the look of brass from the late 1960's or early 1970's. 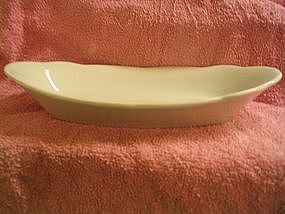 It measures two inches wide by 2 inches long, and has no dents-it has been used, but there is no wear to the finish. It has developed a very nice patina. 2 ashtrays are available and priced individually. I will need your zip code to calculate postage. 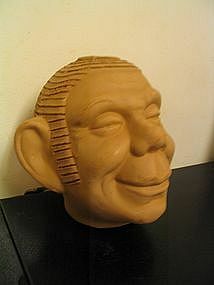 Don't know a lot about this piece, although I've had it for years. 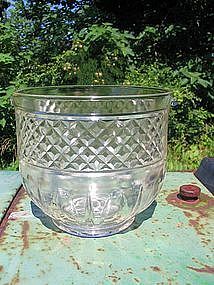 It has a most interesting bottom because the cut glass is in a checkerboard pattern. 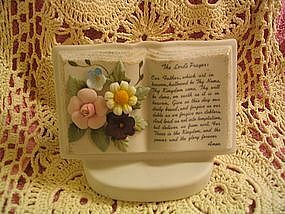 It is 5 1/2 inches in height and 6 inches across the top. No chips, cracks, breaks or rough rim. I need your zip code to calculate the postage. The box is marked as Honey Gold and Accent Modern. 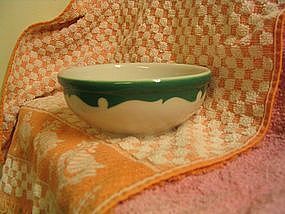 I don't believe we ever used this set - I always thought it was not very sanitary to serve chip and dip, I kept remembering people taking a bite of a chip and then dunking it in the dip. All three pieces are in the box. Additional photos by email. I need your zip code to calculate the postage.